We present a reliable option to treat a femoral neck fracture in a patient with Osteogenesis Imperfecta. Introduction: Osteogenesis imperfecta (OI)-related femoral neck fractures are rare. This is rarely described in the literature. This article presents a way to surgically treat such a fracture. Case Report: We describe the case of a 52-year-old patient with OI Type III with a displaced femoral neck fracture with varus deformity. We performed a hemiarthroplasty of the hip with valgus and shortening osteotomy of the proximal femoral shaft. Conclusion: The incidence of OI is 1 in 10,000–20,000 births. People suffering from OI are known to be at more risk of fractures. Due to the bone deformity and weakness, treatment of fractures in patients with OI is a big challenge for orthopedic surgeons. Combined osteotomy and hemiarthroplasty is a reliable technique to treat a femoral neck fracture in a patient with typical OI-related varus deformity of the femora. Keywords: Osteogenesis imperfect, femoral neck fracture, hip, hemiarthroplasty, osteotomy. The incidence of osteogenesis imperfecta (OI) is 1 in 10,000–20,000 births . OI is a group of inherited connective tissue disorders that cause skeletal abnormalities leading to bone fragility and deformity . OI has a predominantly collagen-related pathophysiology that contributes to bone dysplasia. Different OI types are described based on the metabolic pathway compromised (collagen synthesis, mineralization, and osteoblast differentiation). Bone mineral density, microarchitecture, and bone geometry are modified in OI . Those modified parameters increase bone fragility and deformity. Limb-length discrepancy and deformity of the limb are frequent in OI . Most fractures occur in childhood, and as the patients reach skeletal maturity, they become less frequent (approximately 25% of OI-related fractures occur in adulthood). The most prevalent localization of adult fractures is the vertebral bodies, the hips, and the feet . Non-union, delayed union, malunion, or implant loosening isfrequentely described in OI-related fractures . When surgical fixation is considered, load-sharing intramedullary implants are strongly preferred over rigid plate constructs [7, 8]. Due to the typical varus bowed deformity, insertion of intramedullary nails could be difficult and risky. Deformity-correcting osteotomies have been described in some cases [9, 10]. Thus, the management of OI-related fractures is a challenge for orthopedic surgeons. A 52-year-old patient with OI Type III did an unexpected move while sitting in his wheelchair and suddenly suffered from severe pain of his left hip. During clinical examination, typical OI-related varus deformity of both femora was found. His left groin was tender on palpation, and hip joint motion was restricted. There was no sign of cutaneous lesion and no neurovascular compromise. Previous to this incident, the patient was able to walk a few meters with the help of a walking device and was using a wheelchair for the rest of the time. Besides OI, he was not known for any other medical conditions. He reported multiple fractures during his childhood. He never complained of left hip joint pain previous to this accident. X-rays showed a displaced femoral neck fracture with varus deformity Type III according to the Pauwels’ classification. The varus angulation of the left femur was 30°,and posterior angulation was 20°. Apart from the fracture, X-rays showed thin cortices and heterogeneous bone density (Fig. 1a, b, c). We perform a hemiarthroplasty of the left hip with a bipolar cup and a straight, cemented stem (BIBOP cup size 44, stem ARCAD L, size B, both Symbios Orthopédie, Yverdon-les-Bains, Switzerland), combined with a valgus and shortening osteotomy of the left proximal femoral shaft (Fig.2, 3a and b). The patient started physical therapy with active assisted mobilization of his left hip and knee and strengthening of his gluteal and quadriceps muscles on day 1. He was also allowed full weight bearing and was rapidly able to switch from bed to his wheelchair and back by himself. He was discharged from hospital on day 9. At 2 years follow-up, the patient reported no pain, and his ability to mobilize himself was back to the pretrauma state, while the site of osteotomy showed signs of bony healing on X-ray (Fig. 4a and b). Surgical fixation is usualythe treatment of choice for most patients this age suffering of a displaced femoral neck fracture. In this reported case, the poor bone quality associated with the extreme varus of the proximal femur (neck-shaft angle of approximately 95°) would have been a high-risk factor for failure, especially non-union or cut-out of the fixation device. 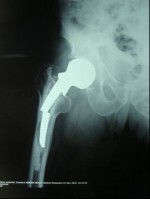 For this reason, we chose to perform a hemiarthroplasty of the left hip with a bipolar cup and a straight cemented stem. A valgus and shortening osteotomy of the left proximal femoral shaft was necessary to fit the straight femoral component to the shape of the bowed proximal femur and to compensate for the lengthening of the femur (Fig. 2, 3a and b). The osteotomy was fixed by means of a 7 hole 3.5 Locking Compression Plate before cementation of the stem. A 1.25 mm cerclage wire had been applied for protection before reaming of the proximal femoral shaft. Bone fragility is the most relevant clinical characteristic of all types of OI. Each type of OI is associated with a more or less severe bone fragility. 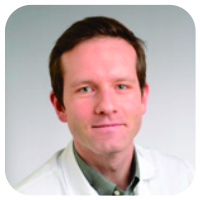 Development of therapies for OI has led to an increase of survival rate and functional outcome . Thus, orthopedic surgeons might have to treat patient with OI more frequently. Only a few cases of femoral neck fractures in patients with OI have been reported. Templin and Schoppmeier reported a simultaneous, bilateral femoral neck fracture during a cerebral seizure in a 80-year-old patient. 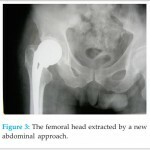 They choose to treat both fractures with total hip arthroplasty with no need of osteotomy of the proximal femoral shaft . Foo et al. used screws with computer assistance to treat a fracture of the femoral neck in a 30-year-old woman . Young et al. treated a femoral neck fracture with percutaneous fixation with three screws allowing to achieve bone union and a good functional result . Chow et al. reported 2 cases of OI-related femoral neck fractures in adults: The first case was treated with two screws after the removal of a DHS and the second case was a 22-year-old man treated with two screws . Fracture of the neck of femur in patients with OI is rarely described. Partial arthroplasty of the hip combined with valgus osteotomy of the proximal femoral shaft is a reliable option in patients with OI-related fracture of femoral neck. When surgical intervention is considered, both the physician and the patient must be aware of the probability of iatrogenic injury, nonunion, and the need for subsequent revision procedures. Careful pre-operative planning and counseling are crucial in this patient population. 1. 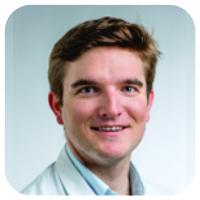 Andersen PE Jr., Hauge M. Osteogenesis imperfecta: A genetic, radiological, and epidemiological study. Clin Genet 1989;36:250-5. 2. Wekre LL, Eriksen EF, Falch JA. Bone mass, bone markers and prevalence of fractures in adults with osteogenesis imperfecta. Arch Osteoporos 2011;6:31-8. 3. Sillence DO, Rimoin DL.Classification of osteogenesis imperfecta.Lancet 1978;311:1041-2. 4. Forlino A, Marini JC. Osteogenesis imperfecta. Lancet 2016;387:1657-71. 5. McKiernan FE. Musculoskeletal manifestations of mild osteogenesis imperfecta in the adult. Osteoporos Int 2005;16:1698-702. 6. Chiarello E, Donati D, Tedesco G, Cevolani L, Frisoni T, Cadossi M, et al. Conservative versus surgical treatment of osteogenesis imperfecta: A retrospective analysis of 29 patients. Clin Cases Miner Bone Metab 2012;9:191-4. 7. 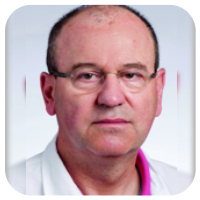 Esposito P, Plotkin H. Surgical treatment of osteogenesis imperfecta: Current concepts. Curr Opin Pediatr 2008;20:52-7. 8. Enright WJ, Noonan KJ. Bone plating in patients with type III osteogenesis imperfecta: Results and complications. Iowa Orthop J 2006;26:37-40. 9. 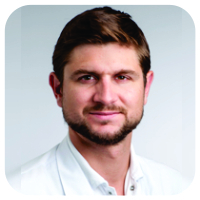 Fassier F, Glorieux F. Osteogenesis Imperfecta: Surgical Techniques in Orthopaedics and Traumatology. Paris, France: Elsevier; 2003. p. 1-8. 10. 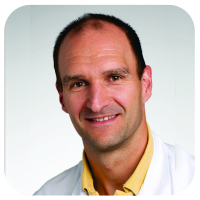 Roberts TT, Cepela DJ, Uhl RL, Lozman J. Orthopaedic considerations for the adult with osteogenesis imperfecta. J Am Acad Orthop Surg 2016;24:298-308. 11. Rauch F, Glorieux FH. Osteogenesis imperfecta. Lancet 2004;363:1377-85. 12. Templin F, Schoppmeier K. Combined total endoprosthesis implantation in bilateral femoral neck fracture with osteogenesis imperfecta tard. Unfallchirurg1996;99:454-6. 13. Foo CC, Chong KW, Wong MK. A case of screw fixation of femur neck fracture with the use of computer navigation in a woman with osteogenesis imperfecta. J Trauma2008;65:1168-70. 14. Young SD 3rd, Nelson CL, Steinberg ME. Transient osteoporosis of the hip in association with osteogenesis imperfecta: Two cases, one complicated by a femoral neck fracture. Am J Orthop (Belle Mead NJ) 2008;37:88-91. 15. Chow W, Negandhi R, Kuong E, To M. Management pitfalls of fractured neck of femur in osteogenesis imperfecta. J Child Orthop 2013;7:195-203. 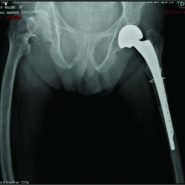 How to Cite This Article: Maeder B, Hanauer M, Poglia P, Chevalley F, Thein E. Hemiarthroplasty of the Hip in a 52-Year-old Patient with Osteogenesis Imperfecta-Related Femoral Neck Fracture: A Case Report. Journal of Orthopaedic Case Reports 2018 Sep-Oct; 8(5): 86-88.